World Wide Fund for Nature, the world’s leading conservationist organization, has appointed Jungwook Hong, chairman of Herald Corp. and its premium food brand Organica, as its newest board member. 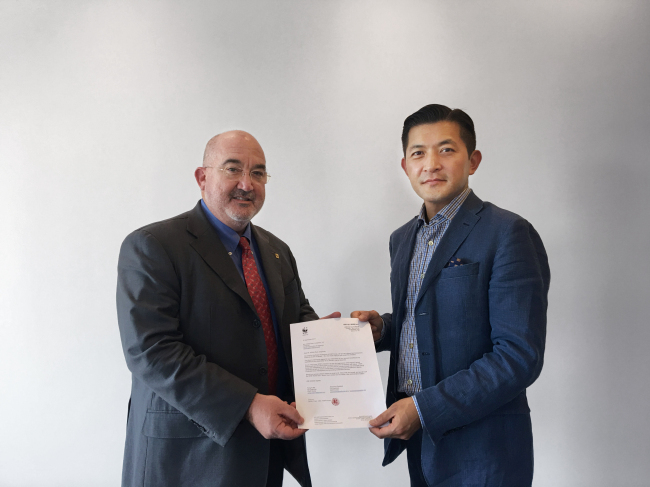 Jean-Paul Paddack, co-chairman of WWF-Korea, visited the company’s headquarters in Seoul on Friday to hand-deliver the letter of appointment to Hong. According to WWF, the Swiss-based nonprofit organization handpicks its leadership among those with in-depth knowledge of global conservation movement equipped with expertise and influence in science, law, management and other relevant fields. Herald Corp. was the first media company to ink a partnership with WWF-Korea. It has been funding and promoting the organization’s core projects such as its research into Korea’s ecological footprint and protection of endangered species here since July 2015. WWF currently holds an active network of 6 million members in 100 nations and aims to build a future where nature and humanity can live in harmony. It set up its Seoul headquarters in 2014 after operating in Korea for nearly a decade. Herald Corp. publishes The Korea Herald, the nation’s largest English-language newspaper, alongside The Herald Business and The Junior Herald. The company’s premium natural food affiliate Organica was launched in 2013 and has been making efforts to meet the WWF’s sustainable food standards.